The Places app allows you to add and manage content that is related to a specific location and display them on a Google map. You are then able to search and filter this content based on keywords in the description, or by Country. When you add your place-related content, you have the option to add an address, city, zip code (or postcode) and country of the location. When you save your content, The Address to Coordinates field (which is not displayed to the user) will convert the information entered in the location fields to the exact coordinates (longitude and latitude) of the location and store them with the content. These coordinates are then used to display your location(s) on a Google Map using the Google Maps API. After publishing the Places app for SEBLOD menu in a Joomla! 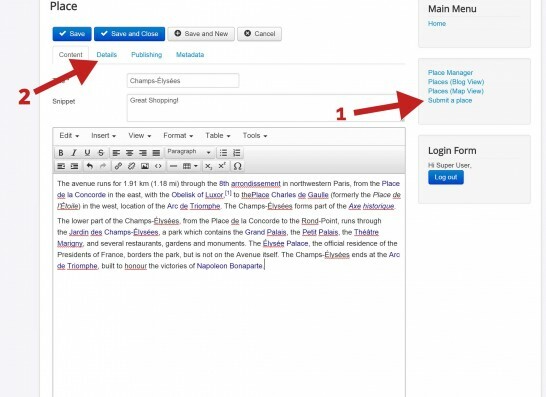 menu module (and you are logged in) you can add a place by clicking "submit a place"